Being Frugal and Making It Work: Let the Summer Olympics Inspire You: Join Swago Olympic Rings and Earn up to 300 Bonus Swagbucks! 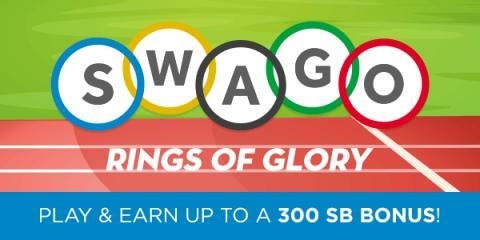 Let the Summer Olympics Inspire You: Join Swago Olympic Rings and Earn up to 300 Bonus Swagbucks! Have you been watching the Summer Olympics? Have the summer games ignited a competitive fire within you? Take that inspired feeling and channel it towards completing your Olympic Rings Swago board next week! Swago is a bingo-inspired promotion run by Swagbucks, a website that rewards you with points (called SB) for completing everyday online activities. You can redeem those SB for free gift cards. If you've never used Swagbucks, participating in Swago is a great introduction to the site because you can get extra bonuses for trying out all the activities as you complete your board. What are you waiting for? JOIN ME on Swagbucks TODAY and start earning your free gift cards!